For those of you who may not know, we loovveee food! Coco is the main cook, but Butter has been trying her hand in the kitchen as of late also. We really made an effort to cook more at home because not only is fast food unhealthy but it’s also very expensive. Think about it: if you buy a basic meal from a fast food restaurant everyday for a month, you’d be spending at least $300 on junk alone! We don’t know about y’all, but we could definitely be using those coins towards a better cause. Since we started cooking more, we’ve found some cheap but healthy meals to prepare. It often takes baby steps to establish a solid, healthy lifestyle and your diet is the most important component. In an effort to choose healthier options, we decided to replace ground beef with ground turkey. Now, know that we would NEVER replace pork bacon with turkey bacon (we love bacon way too much and it is absolutely NOT the same!). Ground turkey, however, isn’t as bad: the dish almost tastes exactly the same (if not better) as using red meat, but it’s much more leaner and healthier. We make everything from ground turkey tacos, turkey burgers, turkey chili, sloppyjoes…you name it. One of our favorite go-to meals are ground turkey stuffed shells. It’s super easy, quick, inexpensive and of course, yummy! 1. Boil 3-4 cups of water; add shells and cook on medium for about 8-10 minutes. Drain, and set aside in cold water. 2. In a large skillet, cook ground turkey until it is no longer pink; drain, and set aside. 3. Drizzle cooking oil into skillet until hot, then add peppers and onions. Cook until tender and translucent. 4. Add meat, sauce and seasonings to skillet, mixing well. Simmer on medium-low for 5-10 minutes to let the flavors blend. *If you prefer a sweeter red sauce, add sugar. Spicy sauce, add crushed red pepper or cayenne pepper (SPARINGLY). 5. Preheat oven to 375 degrees; line a 3 quart glass baking dish with foil, then spread a thin layer of the pasta sauce in the pan to prevent the shells from burning. 6. Fill cooked pasta shells with a hearty spoonful of the ground turkey mixture. 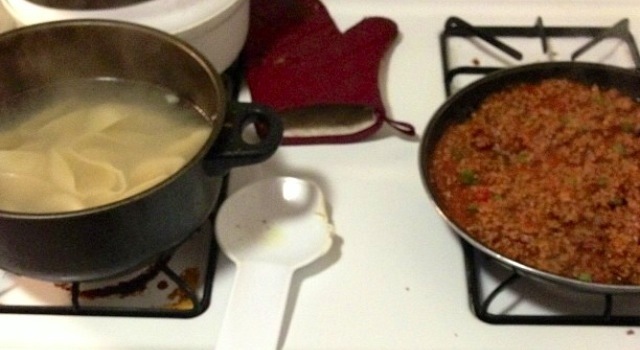 I would recommend using a large table spoon or a small stirring spoon. 7. 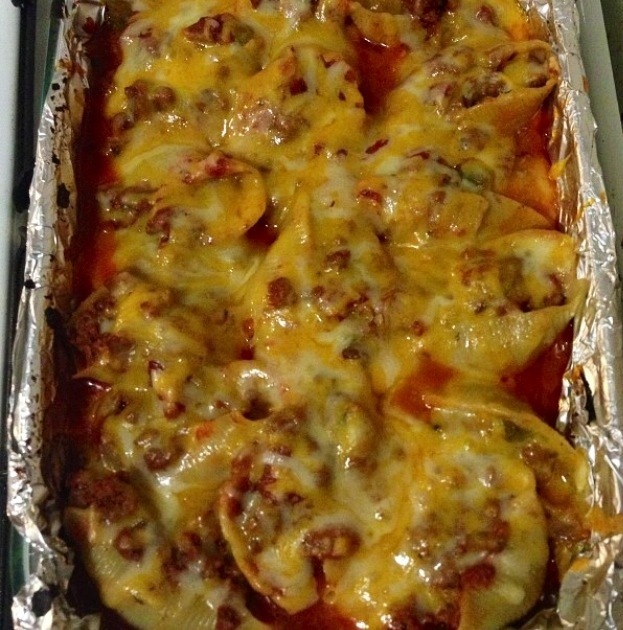 Place stuffed shells in pan, pour any leftover sauce on top of shells then generously sprinkle shredded cheese on top. 8. Bake, uncovered, for about 20 minutes or until cheese is slightly brown on top.